The iPad Mini. The Goldilocks Device? The rumors are now rampant. The Wall Street Journal is reporting that mass production is underway. So what's an iPad Alone guy, who uses an iPad as his primary computer, think about the iPad Mini? To be honest, I'm conflicted. On the one hand, my iPad stands Alone with a capital A. I mean heck it's the title of the blog. I don't want to carry around other stuff, even if it's another iPad. Once you get used to being laden with only an iPad it's really tough to start throwing other stuff into your bag. Light weight is everything. Beyond weight, what is the case for overall utility? If there is one area where I can honestly say my iPad falls a bit short for me it's in casual reading. I almost never hold my iPad in one hand – it's too heavy and awkward. Two handed, or on my lap, it's wonderful. But quick, on the go reading…not so much. Reading on an iPad is more akin to reading a hardcover novel. Reading on my iPhone5 is more like…something my eyes aren't so happy about. So perhaps the iPad mini is a paperback. Hmm. I might like that. But is there any use case for me beyond reading? On my iPad I type pretty much exclusively in landscape. I don't expect that the Mini's smaller screen will be particularly conducive to typing. I'm sure I could do it in a pinch, but it's tough to imagine any input scenario wherein I'd pick the Mini over the iPad. Music? iPhone5. Games? Maybe, but I think I'd likely go bigger (iPad) or smaller (iPhone5). Video? Same. Then there's the question of how light is light enough? Judging by my wife's 7.5 ounce Kindle Touch (same weight as the newer Kindle Paperwhite), 7.5 ounces is about right. Less than half a pound. Spread over its size it feels quite minimal in the hand. 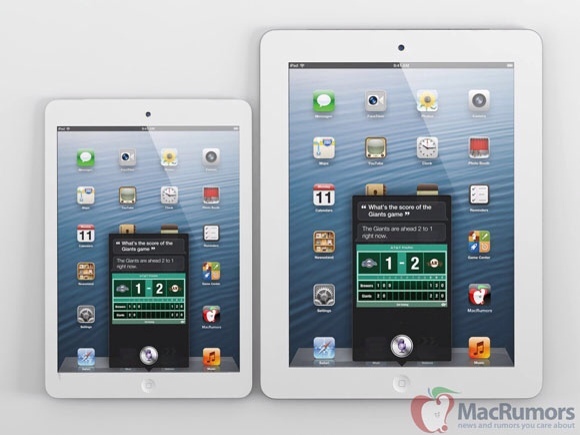 Can Apple deliver an iPad Mini of less than half a pound? To be honest I doubt it. I'd expect it to be more in the 14-15 ounce range. Under a pound, but no featherweight. Obviously, the iPad Mini will be capable of several orders of magnitude more stuff right out the box than the Kindle Paperwhite will ever be. And clever devs will no doubt release apps which are perfectly geared toward the Mini's screen size. EDIT: It’s been brought to my attention that the recently introduced iPod Touch (with the same 4″ screen as the iPhone 5) sells for $299. That makes it seem quite unlikely that the iPad Mini would be $199 let alone $179. That said, maybe supply chain dynamics are at work here. The internals of the mini are rumored after all to be those of the iPad 2, with a shrunken version of the SoC at its core. But the market may dictate that Apple has to get to at least $249 if not $199. The Nexus 7 is $199. So is the new Kindle Fire HD. And those have higher resolution screens than what is rumored for the mini. Going to be tough I think for Apple to price the mini at a serious premium unless people are so completely locked in with apps and media that they can’t conceive of purchasing a non Apple tablet. This entry was posted in Hardware, iOS, ipad, ipad mini, Musings, Rumors, Speculation and tagged cheating iPad as primary computer, Hardware, iOS iPad as sole only computer, iPad alone, ipad mini, New iPad. Bookmark the permalink. 2 Responses to The iPad Mini. The Goldilocks Device? Many thanks for your observations about the mini. It’s left me wondering, too, just what they can do with it to make it worthwhile. … I’ve been following you since you started iPad alone. Me, I like the iPad for writing with a standard keyboard. Daedalus is my main app for writing. I also like Touchwriter for handwritten notes, and Adobe Ideas for drawing. There’s a kind if intimacy about the iPad that awakens my muse. Thanks so much for posting Ernie. You know it’s interesting – if you already use a keyboard, then you may have better luck with the mini for broader purposes than would I. My keyboard dock is sitting on my desk, practically unused since I bought it. Probably should sell it at this point! Thanks for the list of apps. I actually haven’t used most of them but will check them out.